Kybella® is an injectable treatment designed to treat submental fullness (double chin). Kybella® is the only FDA-approved injectable treatment that destroys fat cells under the chin. The active ingredient in Kybella®, deoxycholic acid, is found naturally in the body and aids in the breakdown and absorption of dietary fat. Kybella® is injected under the chin and destroys fat cells. Once destroyed, the cells can no longer store or accumulate fat. It is possible to need more than one treatment, but once you reach your desired look, no further treatments will be needed. Kybella® is the procedure of choice for double chin treatment in Miami. 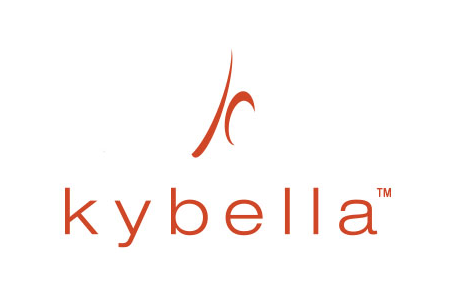 Treatment can only be administered by a KYBELLA®-trained medical practitioner. At each treatment, you will receive multiple small injections under your chin, and the injection process takes about 15 to 20 minutes. The exact number of injections will depend on the amount of fat you have under your chin and your desired profile. Since everyone’s chin profile is different, the number of treatments varies from patient to patient. Your medical practitioner will help determine how many treatment sessions you need based on the amount and distribution of your submental fat and your personal treatment goals. Each KYBELLA® treatment session is given at least 1 month apart and you should not receive more than 6 treatments. After a KYBELLA® treatment, you will likely have some swelling, bruising, or numbness under your chin. Be sure to inform your medical practitioner if you develop an uneven smile, facial muscle weakness, difficulty swallowing, or injection site problems, such as bruising, hair loss, open sores (ulcers), and damage and tissue cell-death (necrosis) around the injection site. Call your medical practitioner if you develop open sores or drainage from the treatment area. These are not all the possible side effects of KYBELLA®.